Keeping your bathroom as clean and efficient as possible is an essential part of ensuring that hygiene standards remain high. This absorbent 2-ply toilet tissue is 85% recycled for a more environmentally friendly washroom solution. 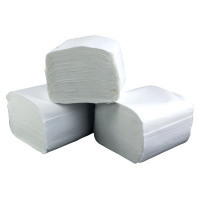 Bulk pack toilet tissue is also more cost effective than standard rolls and produces less waste. Each bulk pack contains 250 sheets fo tissue for less frequent refilling.